This was posted on October 5, 2018 by Teri Maxwell. Many of you greeted GiGi, my mom, on her birthday when we posted about that. I thought you might like to know a little more about how her life is impacted with so many Maxwells living close to her. 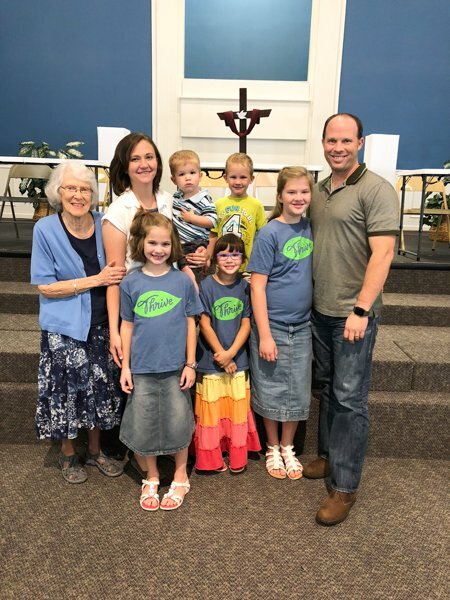 She is a greatly-beloved mom, grandmother, and great-grandmother. Even at 86, she invests in her family, and they invest in her. Lunch out with me on Wednesday and then grocery shopping together. Dinner at Christopher and Anna Marie’s Wednesday evening. On weekdays, Melanie and her children go over to GiGi’s house to put her American flag up outside and say the Pledge of Allegiance with her. 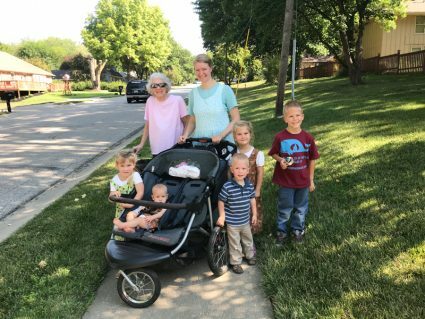 After flag time, she walks with Anna Marie and her children in the morning. During the school year, Abby and Bethany each had an afternoon a week when they went to GiGi’s house to work a puzzle for 3/4 hour. 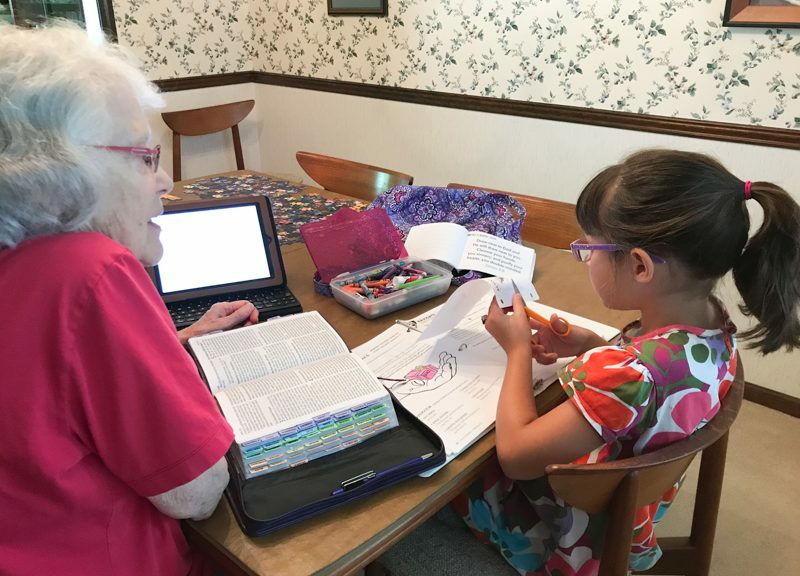 This summer GiGi helped Abby, Bethany, and Christina on their Bible Bee study having a girl over for 1/2 hour a week on different days. She listens to Joshua read aloud for 45 minutes once a week. 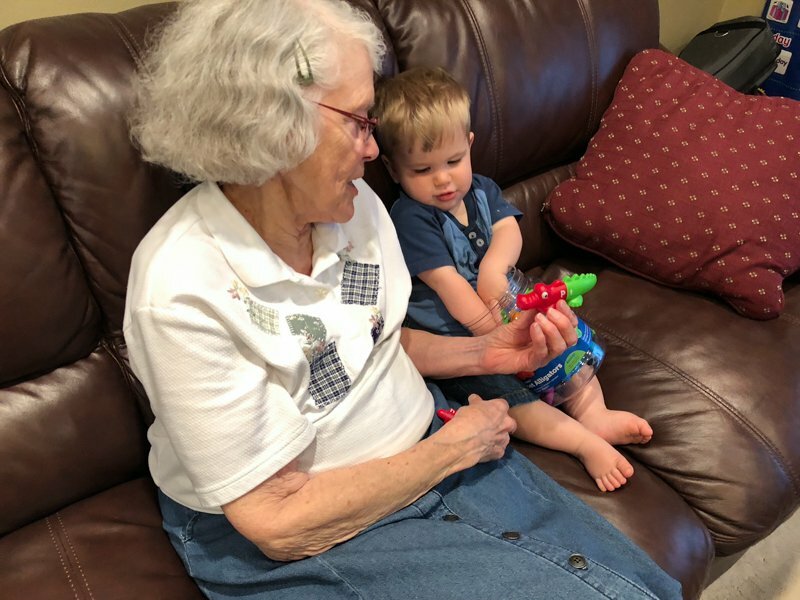 On Fridays, most of the great-grandchildren come over, with Aunt Anna and Aunt Mary to help oversee them, for an hour of playtime and reading time. GiGi is often included in outings that Nathan and Melanie or Christopher and Anna Marie make with their children. If someone’s washing machine is broken, they do laundry at her house, and the clothes are folded when they return to pick them up. Such a blessing to have an older member of the family around. Yes, it is a blessing and until four – five years ago we still had my Dad here and both Steve’s Dad and Mom although they were about 3 – 4 hours away. His mom was near his sister and his dad was remarried. I am also very grateful and blessed to live close to my grandma: she is 91, and I cherish every opportunity I have to spend time with her. I love hearing her stories from when she was a little girl, and have started compiling a diary with all of her memories. 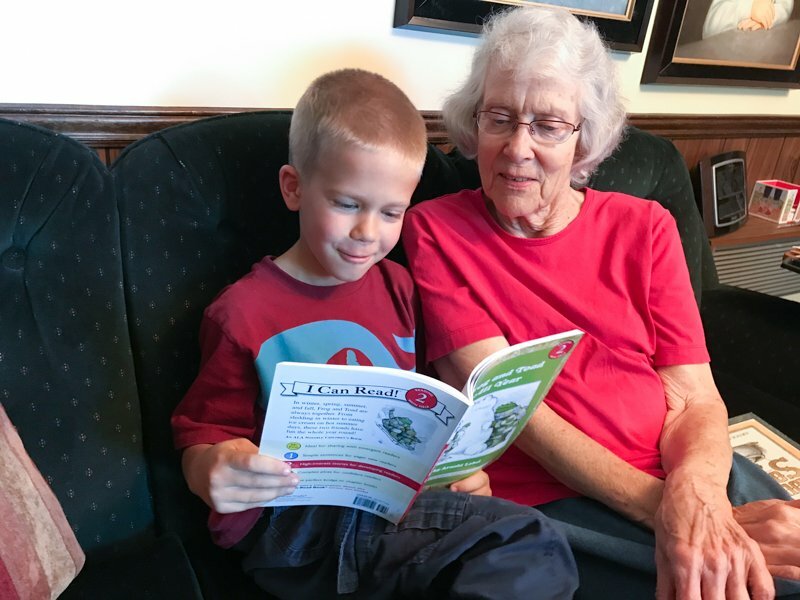 What a wonderful relationship you have with your grandma and then the treasure you are creating by writing down her memories and stories. Thanks for this post, Teri. 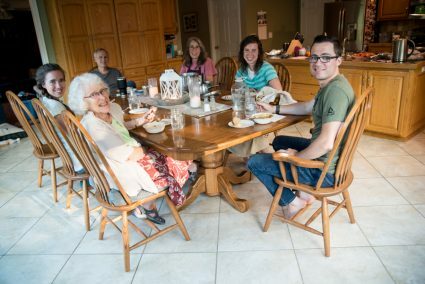 It is encouraging to see your family taking care of your mother and spending time with her. It is a dear hope of mine that our children will do the same for my husband and me when we’re old, and also for our autistic son. Unfortunately, all of our children’s grandparents live several hours away or more, so they haven’t experienced this kind of daily or even weekly interaction with them. Having family surrounding you is such a blessing! Yes, distance makes these kinds of face to face relationships harder although with Skype and Facetime I think it helps some at least with communication. We moved to Kansas 28 years ago to be near our families as they grew older and ended up really close to my parents. For most of those years, my parents didn’t have old-age needs. They invested in their grandchildren’s lives during those earlier years too. There are so many stories I could tell of the sweet times they had together and then of the way the family pulled together to help my mom care for my dad at home when his health failed! This is a beautiful post and it really blessed me!! Praise the Lord! Hi Anne. Yes, praise the Lord! Very blessed to have Gigi so close and have her part of our lives and be part of her life on a daily basis. I love this post! It is so nice to have a Grandma living near you! My Grandma also lives near me, and we love doing things with her! That is wonderful! Such a sweet time in life and will be special memories too. It is such a blessing to have grandparents around. My husband’s elderly mother lives with us. She is now mainly bed bound and we have to have carers in to help but she loves seeing the children, and the cats! The children pop into her room and talk with her. The two cats wander in and out, too. It has been a blessing, in many ways, to have her living with us and one of the most precious times of my day is reading the Bible and praying with her. Very special. It is an investment in your mother-in-law and a special opportunity for your children. Despite the difficulty of caring for someone bed bound, even with care-giving help, you see the blessings and give thanks! I love this post! Gigi evidently has a servant’s heart, and she leads a very busy and fulfilling life. (Plus, Gigi, you look gorgeous!) What wonderful role models both Gigi and Teri are to all of us with grown children, as we enter a different phase of life. Gigi has a way of always looking beautiful! The Pledge of Allegiance tradition is so very sweet! 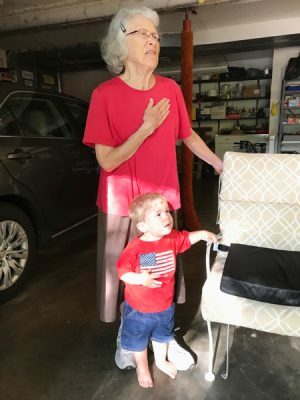 They are very cute doing the pledge from age 1 to 86. Such a precious, precious post! Thank you. Four generations who get to interact on a daily or almost daily basis! Very precious indeed! Thank you for sharing this is a very special post !!! I pray my family can be as much a blessing to my mom someday as she has been to us. 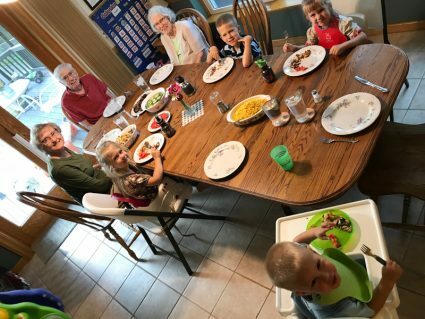 I know it can’t work like that for all families, but it sure is special when it can – grandparents help the young families while they still have their health and then as that health fails, the younger families aren’t quite so young any more, and they can step in to help with the grandparents/great-grandparents. I was so blessed to watch all five of my boys, married and unmarried, help care for my dad in his last year and a half of life. They had a schedule put together, covered for each other if one of them was sick since they didn’t want to expose my parents to illness, and not only brought physical help to my mom but love and fellowship. Aw so sweet. Btw what is the Bible bee? I have a friend who was doing that too. The Bible Bee is a Scripture memory competition that includes not only Scripture memory but study of the passages as well. The actual Bible Bee is in November in San Antonio. You can Google it to find out more details. This is one of my favorite posts ever. So many times the needs of older ones such as great grandparents are overlooked as many families lives are too busy with activities to include the older ones. Distance does make it difficult for some to provide daily interaction in person. I hear so many stories of lonely elderly people and it is sad. 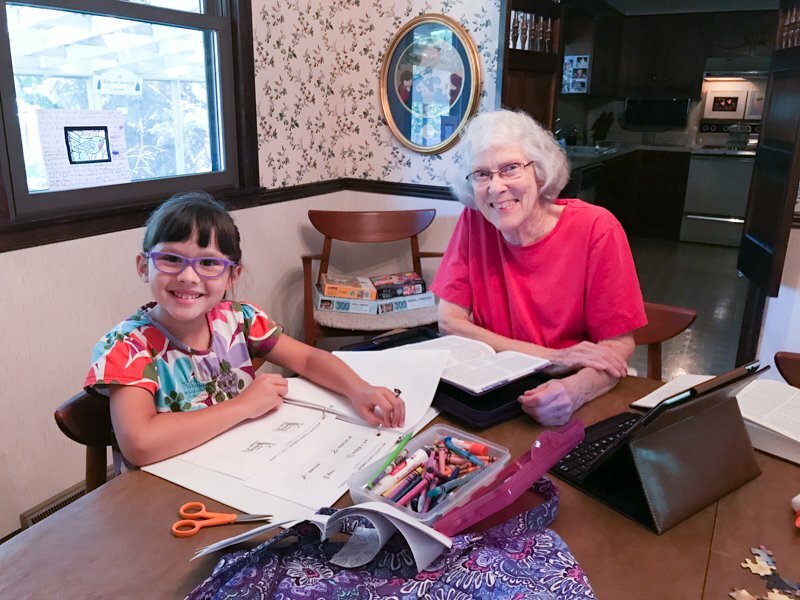 Sometimes it is hard financially for a family to help their elderly relatives depending on jobs, location and schedule, but I think this is a lovely example of ordering lives around including Gigi. My father recently moved to a senior community several miles away from my family and it sure has been a blessing to be able to take him food and visit. It is so hard to see my mother in law and my father lonely. Do you have any suggestions on what to do when they are lonely and you can’t always be there to visit? Again, my favorite post ever seeing how Gigi is involved in family. That’s joyful and life giving. Thank you! So happy Lucy, that you enjoyed this post. After I wrote it, I remembered even more ways Gigi and our lives intertwine, but maybe we can share that in another post. So special that your dad is close enough now for you to visit, help, and encourage. I wonder if long distance, one would work to make time in a schedule for regular Skype, Facetime, or if they can’t manage the technology just old-fashioned phone calls. That might be daily or several times a week or whatever works. I wonder if having those long-distance visits scheduled would help make sure they happen and help ease the loneliness. I have watched Christopher and Anna Marie and Joseph and Elissa schedule weekly video chats since they were married with the parents who are long distance. 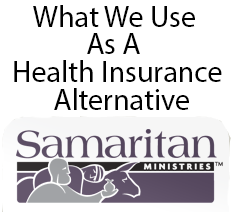 Plus they make it a priority to have regular visits both ways.